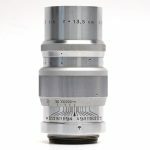 The longest focal length which couples to the LEICA rangefinder, the 135mm ELMAR is an entirely new design utilizing four air-spaced elements. Exceptionally well color-corrected, this is one of the sharpest lenses ever created. Giving 2.7 times the magnification of the 50mm lens, the 135mm is a creative tool providing tight croppings of isolated subject-matter from normal shooting distances. Particularly valuable for frame-filling color compositions, the 135mm ELMAR enables the photographer to concentrate upon essential pictorial details.